Location: at the foot of the Worcester Beacon on the West Malvern Road, 827 feet above sea level. The Hayslad spout lies on the left as you head south on West Malvern Road and is often crowded with locals and visitors filling their containers with the water. Hayslad spring "rises on the west side of the Hills, at a point some thirty or forty yards above the road between "Hillside" and the "West Malvern Spa site," the outflow being a few feet above the level of the road. From time immemorial the spring has been resorted to, and the entire neighbourhood has been blessed with a never-failing supply of water of the purest quality." 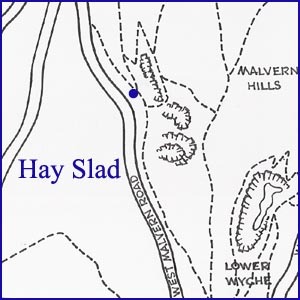 Derivation of Name - Slad probably originates from the Norwegian "slad" meaning a slope or hollow and is a variation of the Old English "slade" meaning a valley or dell. Slad can also mean a strip of greensward or of boggy lands, both of which apply to Hay Slad. Hay indicates an enclosure by hedge or fence. Alternative spellings are found from time to time, the most common being Hay Sladd. Other slades in the Malvern Hills include Winberry Slade and Lange Well Slade, shown on the 1744 Foley Estate map, emanate from the gushing Rushey Valley on the east side of the Hills. Smith erroneously describes this source as St Thomas's which is marked on the Berington family's 1633 map of Malvern. However on the 1852 map of Malvern in Malvern Library, St Thomas's is shown as being at what is now Royal Well. The position of St Thomas's Spring at Royal Well is confirmed by the 1841 Tithe Map. The Malvern Extension Plan of 1892 shows three springs lying together above the Hay Slad spout and to the south of Hay Slad Quarry. In previous centuries this spot was a collecting ground for surplus water, suggesting that in this case "slad" most likely refers to boggy ground. Bennett notes that in the nineteenth century the area around the spring was a bog and as a result a unique bio-habitat developed. This is unfortunately now lost. In 1886 the Conservators removed a pool from near the source to prevent local boys bathing in it. Undeterred, the boys changed to dipping at the source. The boys were also a cause of annoyance to one Mr Salmon, who complained "upon the nuisance caused at Hay Slad by the boys who fetch water with donkey carts - By the present arrangement the barrels have to be filled with buckets and the boys consequently have to be loitering about a long time and thus become a nuisance to the visitors passing that spot - Mr Salmon suggests that something should be done whereby the barrels could be placed immediately under the spout so as to fill quickly." 'Mr Salmon' was most likely Mr Edward Salmon, the Manager of the Royal Malvern Well Mineral Company on West Malvern Road. In 1892 the Conservators decided to pursue a scheme promoted by Mr Perry of "Hillside," West Malvern, to enhance the Hayslad spring. A vast amount of water was being lost through percolation and it was decided to improve the system of conducting the water to the spout, where a new solid stone trough would collect sufficient water for men and animals. The area around the spout was to be made more presentable and the whole architect-designed scheme would cost 40 pounds. The Conservators agreed to pay 10 pounds, the remainder of the cost being raised through public subscription. The work was completed by 1893 but in October that year, for no apparent reason, the trough was vandalised. The Conservators offered a 10 pounds reward for information "that will lead to the conviction of the scoundrel or scoundrels that wilfully damaged the trough, and committed other very disreputable acts at the Hayslad Spring..." The Conservators had to spend #1 repairing the damaged trough and 30 shillings to put the spring back into working order and repair the masonry. The following year, 1894, the trough had to be repaired three times. Three years later, "The Hayslad Spring has again proved costly, repair of drain and filter alike being necessary." From time immemorial the overflow had gravitated freely to Colwall and Mathon and it was suspected that the culprits were inhabitants of Mathon, disgruntled that the residents of the Wyche were getting more water as a result of the improvements. In fact the quantity of the flow to Mathon had not been affected  but the Council were carting water from the spring to the Wyche. The Wyche had no alternative supply during dry summers and for years the unfortunate inhabitants had had to walk to the Hayslad spring to collect their water. Towards the end of 1895 the Council received a letter from the Ecclesiastical Commissioners - who owned a great deal of surrounding lands - warning that the carting of water from the spring could in future be prejudicial; they also enquired as to any further plans the Council had at the spring, to which the Council answered none. In 1894 the Conservators received a letter from Mr Bright, of Barton Court, regarding the proposed alterations at the Hayslad spring. He stressed that since he owned the spring any plans for its development should be submitted to him for scrutiny. The Conservators made it clear that their work was for the good of the spring and the community, and presumably agreed to co-operate with the owner. There were many who doubted Mr Bright's ownership and he had, on one occasion, to write to the Council to convince them that his deeds of purchase did exist. The spring was without doubt an important local resource and the squabbles indicate the reliance that was placed on Hay Slad as a water supply. Piped to the Public Mains - Until the end of the last century the spring water was used freely but in 1898 the water was contained and used, in conjunction with the Danzell and Dingle Springs, for the local public supply. A 100,000 gallon reservoir, which still exists, was built on the hill behind the spout. Slightly north-east of the reservoir is an underground chamber with two flow meters. The spring enters the chamber before discharging into a saltglazed gully which heads towards the reservoir. From time immemorial the overflow from the spout gravitated down to Colwall and Mathon, where it was used particularly by the farmers. In August 1898 a group of farmers from Mathon complained that the work at the Hayslad Spring for the new waterworks had deprived them of every drop of the overflow, of which they should have received one third. On investigation it was found that the water was absorbed before it reached Mathon and consequently it should be piped. Irate inhabitants of Colwall also challenged the Council over the proposed taking of the waters for the piped public supply. Under the 1896 Malvern Link Water Act the Council was obliged to provide not less than 2 gallons per minute compensation water to Colwall. The Malvern Gazette, 11 Aug 1905, puts the figure at not less than 5,765 gallons daily i.e 4 gallons per minute which perhaps indicates either deliberate misleading or wishful thinking. However the local council had recorded 19,217 gallons a day in 1903 as monitored by Copland and Latham, water engineers. As a result of the Acts, today the flow at the spout is compensation water diverted from the saltglazed gully via a wheel valve, released from the spring at a rate of at least 2 gallons per minute under the provisions of the Malvern Water Act 1905 26(1). The water released at the spout comes solely from the Hayslad spring and not from the reservoir which can receive water from the ring main; it is untreated and occasionally Mathon Parish Council monitor the quantity of compensation discharged into the Mathon Brook. Most of the spring now runs into the British Camp Reservoir but the Hay Slad spout has a constant and considerable flow and is a popular point with the public for filling their containers. Many people come to collect the spring water, from such diverse areas as Devon, Birmingham, Oxford, Salisbury and Potters Bar. However, the idea of storing the water for extended periods in domestic containers raises doubts as to the wholesomeness of the water. The quality may well deteriorate, having been exposed to the air and perhaps in containers unsuitable for water storage. Recently there has been a move to fence off the reservoir to prevent the possibility of faecal contamination from sheep and dogs but this has been resisted by the Malvern Hills Conservators. The public facility has also undergone some restoration and improvement works as a result of the Heritage Lottery Fund grant and matched funding. In particular David Armitage's new bifurcating spout has captured the imagination, being the brainchild of the AONB Officer who implemented the improvements. 1. Hayslad before the bifurcating spout by Wendy Harding. 2. Neville Taylor at Hayslad 2011. 3. 2009 Annual Guided Coach Tour. 4. 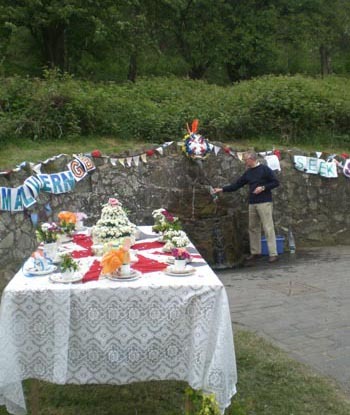 Made in Malvern - this couple celebrated their 2007 wedding by toasting each other at Hay Slad with Malvern's spring water. They arrived in a Malvern-built Morgan. 5. On the famous Springs and Wells Coach Tour. Malvern Advertiser, 14 October 1893. Smith, B. 1964, A History of Malvern, p172. HWRO ref.705:24 BA 366 p20. HWRO ref. 200:05 BA 635/3. Bennett, A. Geology of Malvernia. Hurle, P. The Malvern Hills - A Hundred Years of Conservation, p51. Malvern Advertiser, 11 November 1893. Malvern Advertiser, 16 February 1895. Malvern Advertiser, 12 February 1898. Malvern Advertiser, 11 June/16 July 1892; 15 July 1893; 3 August 1895. Malvern Advertiser, 14 October 1899. Minutes Malvern Urban District Council 2 Feb. 1904. Richardson, L. 1935, The Springs and Wells of Herefordshire. Malvern Gazette, 20 Nov 1992 "Call to Fence Off Tanks".